The Fondaco dei Tedeschi will unlock its potential as a major destination and vantage point for tourists and Venetians alike; a contemporary urban department store staging a diverse range of activities, from shopping to cultural events, social gatherings and everyday life. 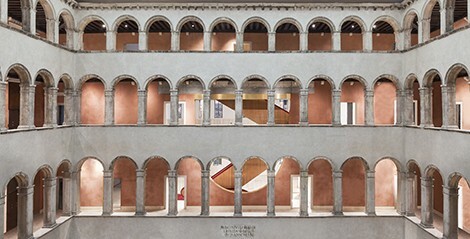 Twice destroyed by fire and rebuilt, manipulated in the 18th Century, and then subject to a series of radical architectural interventions in the 20th Century, the Fondaco quietly embodies Venice’s secret brutality. Regardless of the history of its adaptations (towers removed, courtyard covered with glass, windows added, structure rebuilt) and the objective lack of authenticity of its structure, its legal status of ‘monument’ (granted in 1987) forbade almost any change. 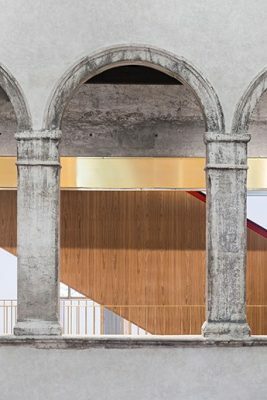 OMA’s renovation, both subtle and ambitious, continues the Fondaco’s tradition of vitality and adaptation, its preservation yet another chapter of the building’s illustrious and multi-layered history. It avoids nostalgic reconstructions of the past and it demystifies the ‘sacred’ image of a historical building. First constructed in 1228, and located at the foot of the Rialto Bridge across from the fish market, the Fondaco dei Tedeschi is one of Venice’s largest and most recognizable buildings. Almost entirely reconstructed with modern concrete technology during 1930s, the Fondaco is a historical palimpsest of modern substance, its preservation spanning five centuries of construction techniques. Regardless of the history of its adaptations (towers removed, courtyard covered with glass, windows. 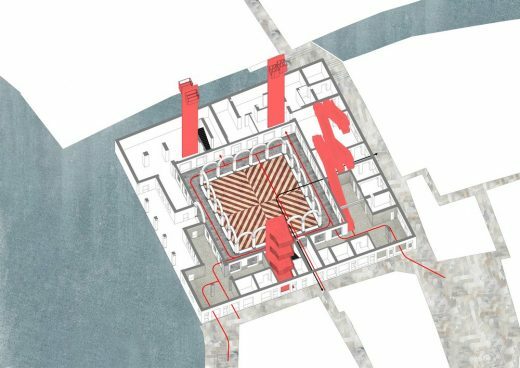 OMA’s renovation scheme is based on a finite number of strategic interventions and vertical distribution devices that support the new program and define a sequence of public spaces and paths. 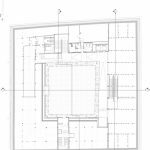 Each intervention is conceived as an excavation through the existing mass, liberating new perspectives and unveiling the real substance of the building to its visitors, as an accumulation of authenticities. The project – composed of both architecture and programming – opens the courtyard piazza to pedestrians, maintaining its historical role of covered urban ‘campo’. The new rooftop is created by the renovation of the existing 19th Century pavilion, standing over a new steel and glass floor which hovers above the central courtyard, and by the addition of a large wooden terrace with spectacular views over the city. 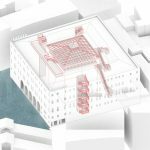 The rooftop, together with the courtyard below, will become public venues, open to the city and accessible at all times. A plan to convert a 500-year-old palazzo in the heart of Venice into a Benetton ‘megastore’ has come under attack from Italian heritage campaigners, reports The Daily Telegraph. The Renaissance building, known as the Fondaco dei Tedeschi, overlooks the Grand Canal and the city’s famous Rialto Bridge. It was built between 1505 and 1508 as the headquarters for German merchants – ‘tedeschi’ means Germans in Italian – who used Venice as a base to trade spices, silk and other goods between the Orient and northern Europe. It was painted by Canaletto and other masters and is located adjacent to the Rialto Bridge. The four-floor building became a customs house under the Napoleonic occupation of Venice and then the Venetian headquarters of the Italian post office, but has stood empty and unused for several years. Bought by Benetton in 2008 for 53 million euros (£45 million), it is now to be converted into a huge clothing and accessory store by the Italian fashion company. 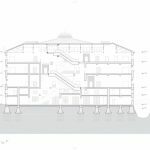 As part of the building’s refurbishment, a section of the roof will be removed and turned into a panoramic terrace, parts of the balustrade will be demolished and moving walkways will be installed in the interior. 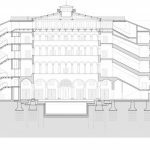 Two new entrances will be created in the adjacent square of Campo San Bartolomeo and on the Rialto Bridge side of the palazzo. 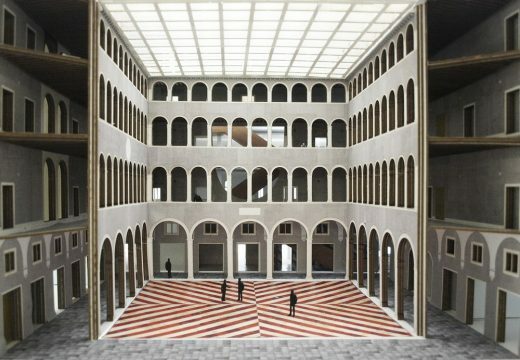 The project has been attacked by Italia Nostra (Our Italy), a prominent heritage group, which criticised what it called “very serious alterations which will change the fabric of the building”. The palazzo’s “architectural integrity and historic identity” will be gravely compromised by the restructuring, particularly the creation of the rooftop terrace, Italia Nostra said. The group has filed an official objection to the project with the ministry for cultural heritage and Italian prosecutors. 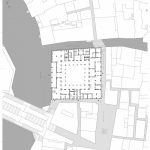 OMA today unveiled its design on 27 Aug for the major restoration and redefinition of one of Venice’s largest and most iconic buildings: the Fondaco dei Tedeschi, a property owned by the Benetton family, adjacent to the Rialto Bridge on the Grand Canal. First constructed in 1228, the Fondaco dei Tedeschi began as a trading post for German merchants and became a customs house under Napoleon in 1806. Its use as a post office has diminished in recent years, leaving much of the building unused and inaccessible for the first time in centuries. The latest evolution of the Fondaco will create a thriving contemporary trading post in the form of a culturally-programmed department store. The Fondaco dei Tedeschi, twice rebuilt completely, with its current configuration dating from 1506, has undergone many radical transformations since then. To accommodate new uses, its towers have been removed, courtyard covered with glass, structure rebuilt, façade restored, and new windows added, among many other interventions. For the Fondaco, preservation is a history of change. Commissioned by the Benetton family’s property group, OMA has designed a range of architectural modifications and developed a cultural program to reactivate the building as a vital public space, from top to bottom. A terrace with rare views of the Grand Canal will be created by removing two sides of the existing roof, leaving the building’s profile intact while unlocking exciting potential for the Fondaco dei Tedeschi as a major destination and vantage point for tourists and Venetians alike. The rooftop, together with the courtyard below, will become a public venue for events including exhibitions and film screenings. 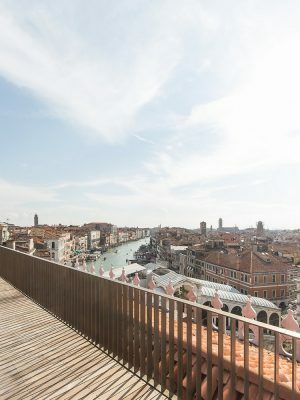 A year-round cultural program will be aimed at locals and tourists – the 20 million who visit the city each year, as well as the 900,000 who come specifically for the Biennales and festivals. 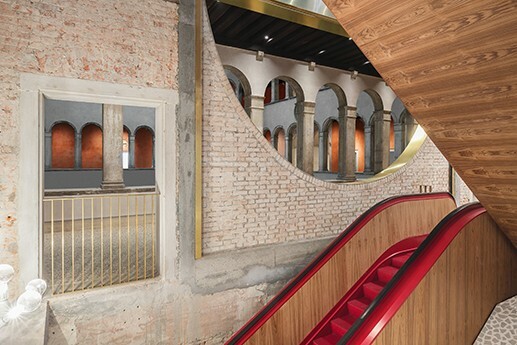 The new Fondaco dei Tedeschi, as both prestige department store and public event space, aims to reestablish the historic Venetian connection between culture and commerce. The Benetton family has always demonstrated this twin spirit, uniting the innovative and international with profoundly local, Venetian roots. 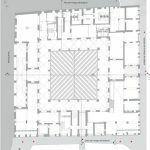 New entrances to the Fondaco will be created from the Campo San Bartolomeo and the Rialto to encourage circulation, escalators will be added to create a new public route through the building, rooms will be consolidated in a way that respects the Fondaco’s structure, while crucial historic elements like the corner rooms will remain untouched. Historic aspects of the building, lost for centuries, will be resurrected: the walls of the gallerias will once again become a surface for frescoes, reappearing in a contemporary form. 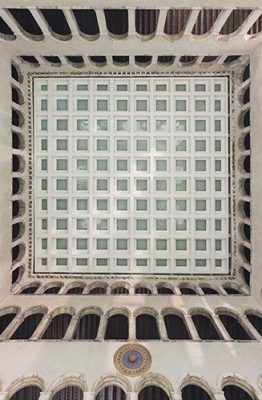 OMA’s renovation scheme – both ambitious and subtle – continues the Fondaco dei Tedeschi’s tradition of vitality and adaptation. Venice will acquire a landmark department store that will become a shared civic facility and a crucial element in the cultural fabric of the city.